Put the pig's head, heart, lungs and liver to boil with salt. After boil them, pass them through a meat grinder together with onion. Put in a bowl the minced meat with onion, thyme, salt and pepper and mix them. Fill the intestines and tie them at both ends. Sausages must not have more than 15-20 cm. Sausages are placed in a pot of boiling water and let them boil for about 30 minutes. 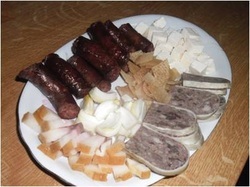 Sausages are consumed as fresh, warm or cold, on the winter appetizer plates with onion and pickles. 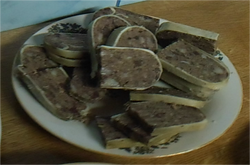 Wash meat, cut into cubes and then pass through a meat grinder. Peel the garlic and crush it. In a bowl put the ground meat, garlic, pepper, paprika and mix them. The intestines are washed both outside and inside. Attach the utensil for sausages to the meat grinder and put the intestine on it. Fill the intestines with the mix. Then hang on a wooden bar to smoke. Sausages are fried in a pan with hot oil and served hot with mustard and pickles. The feet are thoroughly cleaned and washed in several waters. Put them in a pot, then fill the pot with water and let at fit heat. After giving the boil, foam whenever needed. Add carrots and onion and let them to boil until the meat falls off the bones. Remove the meat from the pot and let them to cool. Crush the garlic and add to the cooked ingredients. 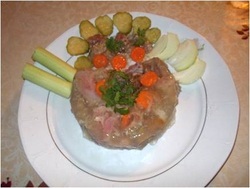 Prepare bowls in which put the meat and fill them with the juice and put them in the refrigerator to congeal. Serve it after it has cooled. Put the meat products in a pot to boil. Let it boil for an hour. Then finely cut meat products. Meantime, chop green onions, garlic, parsley and dill. When the meat is boiled, chop it and mix it with the vegetables. Then on a tray, caul stretches and minced meat is put into it, then we put them in the oven. Let it in the oven for an hour. After removing from the oven, put it on the plateau, let it cool and then cut it into slices and serve with onion, pickles or mustard.